A Trapezium is a quadrilateral which has a single pair of parallel opposite sides. A square, rhombus and a rectangle can be considered as trapeziums since these have at least one pair of parallel opposite sides. = 1/2 * (sum of the length of the parallel sides) * height. 1/2 * (4 + 10) * 8 = 56 sq. units. 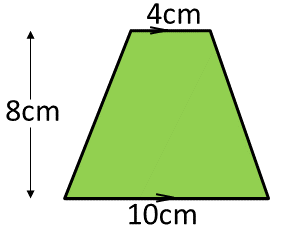 1)For the area of a trapezium, we need the values of base1,base2, height. 2)By substituting the values of base1,base2,height into the formula area=((base1+base2)/2)*height,we will get area of trapezium,the value will store into the variable “area”. 1)We are using float area(float a, float b, float h) function to calculate the area of the trapezium. 2)We are calling the function using area(a,b,h), then called function will calculate the area of the trapezium and return the value. 3)The return value will be assigned to the variable “A”. 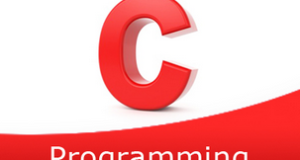 1)We are passing the addresses as arguments in the calling function AOT(&b1,&b2,&h,&area). 2)The called function AOT(float *a,float *b,float *h,float *area) calculate the area by retrieving the values at that addresses. 3)The calculated value will store into the pointer variable “area”. 2)area(b1,b2,h)replaced with that expression given at #define.